Want to give your bathroom a makeover but can’t renovate, whether you’re renting or just don’t have the budget? Here are 8 easy, affordable ways to update your bathroom when you can’t renovate. When you’re scrolling through gorgeous bathrooms on Pinterest or shut off the latest episode of Fixer Upper featuring another beautiful bathroom … getting up and walking around the corner to your outdated bathroom can be frustrating. Especially if you don’t have the budget for a renovation right now or you’re renting so renovating isn’t an option. Ooooh do I get it. Gutting and starting over with this bathroom wasn’t an option, but we did find some ways to update the bathroom to make it more our style. If you’re in the same boat, I figured I’d share some of our easy, affordable tips. If you’re in the market for a bathroom renovation, check out my favorite bathroom renovation design tips (and the before and after of the last bathroom we fully renovated).You can also grab a copy of my bathroom renovation checklist in that blog post. I say it all the time but guys, the power of paint! Seriously! It makes such a difference. We used Ryegrass by Sherwin Williams. I talk about this a lot when I share furniture makeovers, but new hardware can really make such a difference. It may not be a new vanity, but it feels like an upgrade. I love crystal knobs – these or these are my faves. 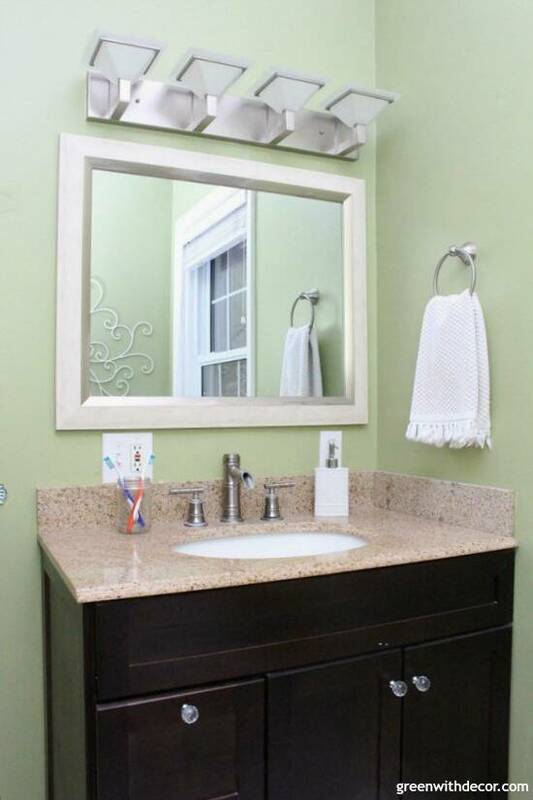 This is one of THE easiest ways to update the look of a bathroom without much time or money. We found this new one at a local home decor store’s big sale over the summer. The mirror inside was a little crooked, but Kalen took the back off and fixed it in about five minutes. Win-win. I love how you can see the wood grain of the frame. These little hooks were a flea market find, and I loooove them. These are similar if you’re looking for some. Somehow these little hooks just freshen up the bathroom and make it feel more personal rather than towel bars someone else picked out. Especially important if you’re dealing with a freezing cold tile floor (will winter ever end?!) or just a floor you don’t love that you’d rather cover up. I bought this white one and this gray one, and they’re perfect for the space. The white one is so fluffy especially after you wash it. I shared how we updated this metal wall art last week. It was black and too dark for the space so it’d just been sitting in the sunroom collecting dust. With a little white paint, it looks like a whole new piece (and cost us nothing!). We’re not replacing the faucet, but it’s an easy switch that you can either replace back/take with you when you move or an update you can make prior to renovating that you can then use after renovating. We decided to just leave the light fixtures in here, but again, this is an easy switch you can make to then take with you or to jumpstart a bathroom remodel. If you’re looking for new bathroom lights, check out these posts for my favorite bathroom vanity lights on a budget and sconces on a budget. Are you enjoying your dream bathroom or not quite yet? Do you have any other fun easy tips for updating a bathroom when you can’t renovate? This bathroom makeover is part of the $100 Room Challenge hosted by my friend Erin from Lemons, Lavender & Laundry, where bloggers update a room for just $100 (it’s possible!). All of the other bloggers’ projects are linked below if you want to see. Great tips! I love your hooks and little crystal knobs! Little touches can make such a difference to a space! Thanks, Morgan! Little touches really can make such a difference! Paint and rugs!! Totally agree! Great ideas here! I can’t wait to help my daughter decorate her apartment next year with these tips! Yay glad you can use them! They’re perfect tips for an apartment! Great ideas to share since gutting isn’t always an option! 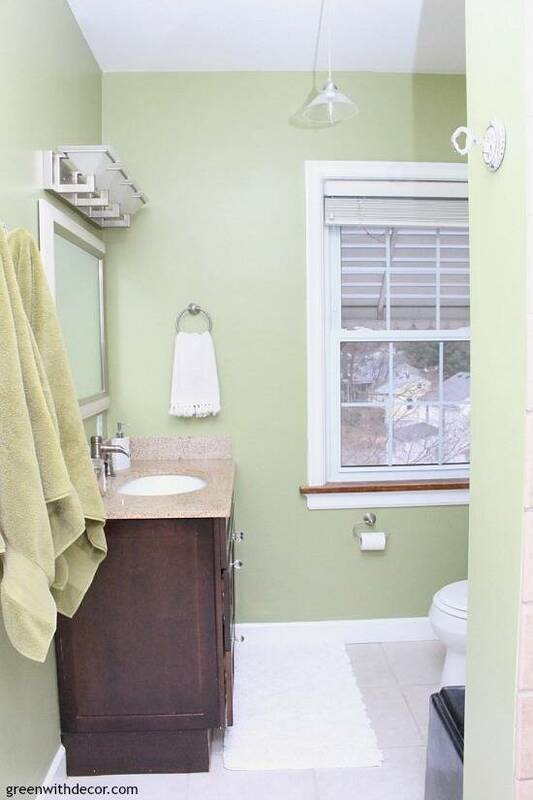 And your bathroom looks so happy and cheery now! I love those hooks! Thanks so much, Melissa! The hooks might be my favorite part! It is looking great so far, and what great tips for updating on a budget! Paint is my favorite way to update spaces! All of these are great tips, Meg it’s looking good over there! Oh I love those towel hooks! They are just beautiful! Thanks, Kristen! I love them, too! Thanks, Erin! I love the towel hooks! Love those towel hooks. They are definitely going on my flea/vintage shopping list. Your room is coming along so nicely. I love the bright and freshness of it all. Thanks, Patti! I’m so glad I found them! I love that color! And those hooks. I had some great ones that somehow got lost in the shuffle when we moved. Now you’ve motivated me to try to find some for our master suite. Thanks, Shelley! Oh I always hate that about moving – things just randomly disappear! Hope you find some new hooks!